So much for staying hydrated. It seems Phil Kessel has had more highlights off the ice this year than on it. That’s not a knock on Kessel’s play — his 74 points rank second in the NHL. 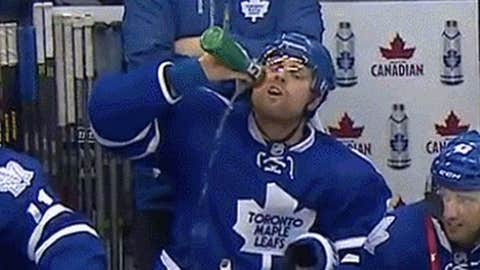 It’s just a statement of fact that cameras always seem to catch the Toronto Maple Leafs star getting weird on the bench. First, Kessel was seen binging on smelling salts during a timeout. Then, it was him crushing an entire bottle of Powerade in Sochi. The winger added the latest entry to this catalog Wednesday against the Tampa Bay Lightning when he spilled about half a water bottle into his lap before flipping it back over his shoulder.